Now is the time to integrate Orisa Lifestyle into how we build community, do business and lead organizations! Join Chief Solagbade Popoola, Orland Bishop and Obafemi Origunwa for this 3-day leadership workshop and learn how to successfully and collaboratively make Orisa Lifestyle a core value in your family, your spiritual community, or organization. The overall focus of this workshop is capacity building and collaboration to create 16 generations of sustainable culture. Collaboration is the active ingredient of Orisa Lifestyle. Collaboration takes much more than good intentions. Individually and collectively, practitioners of Orisa Lifestyle who learn to work effectively across communities will definitely need capabilities that are not presently being taught in our spiritual community: 1. How to build trust between diverse parties 2. How to create shared visions that transcend religious tradition and national identity 3. How to foster shared understanding of complex realities 4. How to develop shared strategies and best practices 5. How to observe and reflect on what is working and not and to adjust thinking and action. In short, effective collaboration is an ongoing learning process that demands an unusual degree of openness – of mind, heart and will - to challenge many assumptions, ways of operating, and cultural norms that we have come to accept as law. Sometimes, what has limited our progress are the very behaviors that have made individuals and groups effective in the past. Spiritual leaders like you, who want to build their capacity to lead change efforts, from wherever they sit within their communities, are invited to attend this Orisa Lifestyle Retreat. The workshop will blend personal capacity building and application to real issues through a series of practice sessions using tools for systems thinking and collective learning. Leadership for Orisa Lifestyle will be both personal and collective: people learning how to work better together by working together to achieve common goals that otherwise might be impossible. 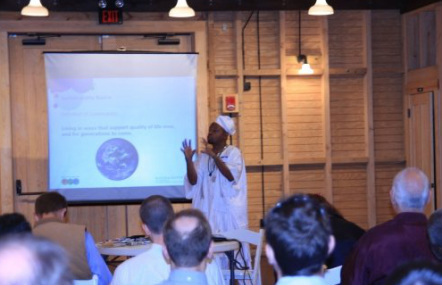 With over 30 years of Ifa knowledge, Chief Solagbade Popoola has traveled the world spreading the holy teachings of Olodumare (God) and instructing a new generation of Ifa priests on the philosophy, analysis and application of IFA’s holy Odus (sacred verses.) The IFA Temple of Los Angeles- Ijo Otura Tukaa has the honor of hosting Chief Popoola’s to the U.S. Don’t miss this historic visit and join us for spiritual guidance and practical wisdom. Also get exclusive access to the first book within Chief Popoola’s IFA book series titled IFA: It’s Core Values. 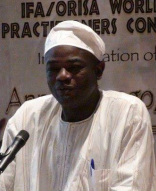 Obafemi Origunwa, MA is founder of Iwalewa Folklife Enterprises, Lecturer at Orisa Lifestyle Academy and Co-Author of Oriki Awon Orisa. I am a professionally-trained counselor, with a Master of Arts in Education with a concentration in Counseling from San Diego State University. I am particularly interested in Jungian psychology. This particular combination of ancient wisdom and modern approach allows me to offer you a unique and refreshing blend of Western and Indigenous healing practices.